Paola Andrea Rey Arciniegas (born December 19, 1979, in Bucaramanga, Santander, Colombia) is a Colombian actress and model. Bucaramanga is the capital and largest city of the department of Santander, Colombia. Bucaramanga has the fifth-largest economy by GDP in Colombia, has the highest GDP per capita in Colombia, has the lowest unemployment rate and has the ninth-largest population in the country, with 521,857 people. Bucaramanga has over 160 parks scattered throughout the city and has been given the nickname "La Ciudad de Los Parques" and "La Ciudad Bonita de Colombia". Santander is a department of Colombia. Santander inherited the name of one of the nine original states of the United States of Colombia. It is located in the central northern part of the country, borders the east with the Magdalena River, borders to the south and southeast with Boyacá, to the northeast with Norte de Santander Department, to the north with Cesar Department, and to the west with Bolivar and Antioquia Departments. Its capital is the city of Bucaramanga. Colombia, officially the Republic of Colombia, is a sovereign state largely situated in the northwest of South America, with territories in Central America. Colombia shares a border to the northwest with Panama, to the east with Venezuela and Brazil and to the south with Ecuador and Peru. It shares its maritime limits with Costa Rica, Nicaragua, Honduras, Jamaica, Haiti, and the Dominican Republic. Colombia is a unitary, constitutional republic comprising thirty-two departments, with the capital in Bogotá. La Baby Sister is a Colombian telenovela produced by Caracol TV which aired in the United States on the network Telemundo in 2001-2002. The series, containing a total of 160 episodes, centers on the romance between two leading protagonists, Daniel Luna and Fabiana Estrella Rivera. On Telemundo, La Baby Sister followed the wildly successful telenovela, Betty La Fea, which has since been reinvented in the US as ABC's Ugly Betty. La Baby Sister was meant to be the successor to Betty la Fea as a hip and funny romantic comedy, and it was partially successful in this goal. Both novelas feature similar characteristics— both were produced in Colombia, and both feature a mix of romance and humor, modern sound editing and camera work, and a plot that centers on a young female protagonist and her family. Although La Baby Sister gained some acclaim from both critics and viewers, it never achieved the popularity of Betty la Fea. Nonetheless, it is often credited with launching the career of Paola Rey, who has since become one of Colombia's biggest television stars. Pasión de Gavilanes is a Colombian telenovela that ran for 188 episodes, from 2003 to 2004. Written by Julio Jiménez, it was produced by RTI Colombia in conjunction with the Telemundo network and with the participation of Caracol TV company. Neutrogena is an American brand of skin care, hair care and cosmetics, that is headquartered in Los Angeles, California. According to product advertising at their website, Neutrogena products are distributed in more than 70 countries. Neutrogena was founded in 1930 by Emanuel Stolaroff, and was originally a cosmetics company named Natone. It is now part of the US-based Johnson & Johnson conglomerate, which bought the independent company in 1994. 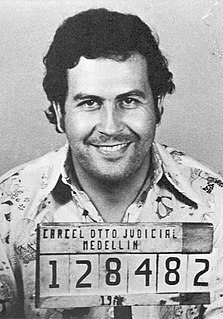 Pablo Emilio Escobar Gaviria was a Colombian drug lord and narcoterrorist. His cartel supplied an estimated 80% of the cocaine smuggled into the United States at the height of his career, turning over US$21.9 billion a year in personal income. He was often called "The King of Cocaine" and was the wealthiest criminal in history, with an estimated known net worth of between US$25 and US$30 billion by the early 1990s, making him one of the richest men in the world in his prime. The Medellín Cartel was a highly organized Colombian drug cartel originating in the city of Medellín, Colombia that was founded by Pablo Escobar. The drug cartel operated throughout the 1970s and 1980s in Bolivia, Colombia, Panama, Central America, Peru, and the United States, as well as in Canada and Europe. Carlos Enrique Lehder Rivas is a former German-Colombian drug lord who was co-founder of the Medellín Cartel. He is currently imprisoned in the United States. Born in Armenia, Colombia, Lehder eventually ran a cocaine transport empire on Norman's Cay island, 210 miles (340 km) off the Florida coast in the central Bahamas. Mónica Spear Mootz was a Venezuelan actress, model and beauty pageant titleholder who won Miss Venezuela 2004. She also represented Venezuela at Miss Universe 2005 in Bangkok, Thailand where she finished as 4th runner-up. Andrea Paola Krum, better known as Paola Krum, is an actress, singer, and dancer, and is one of the many multi-talented Argentine performers of the present day. Natasha Alexandra Rastapkavicius Arrondo, professionally known as Natasha Klauss, is a Colombian actress of Colombian and Lithuanian descent, best known for her roles in Telemundo telenovelas La Venganza, Pasión de Gavilanes, El Zorro, la espada y la rosa and La Tormenta. Clara María Ochoa is a Colombian film producer. She manages CMO Producciones, which promotes important Colombian films like Rosario Tijeras, Soñar no cuesta nada, Como el gato y el ratón, Bolívar Soy Yo and Del amor y otros demonios. Virginia Vallejo García is a Colombian author, journalist, television director, anchorwoman, media personality, socialite, and political asylee in the United States of America. On 18 July 2006, the DEA took her out of Colombia in a special flight to save her life and cooperate with the Department of Justice in high-profile cases, after she had publicly accused several Colombian presidents and politicians of being beneficiaries and accomplices of the leading cocaine cartels. In 2019, she began working for RT Spanish. Como el gato y el ratón is a 2002 French-Colombian comedy-drama film. It was directed by Rodrigo Triana, produced by Colombian filmmaker Clara María Ochoa, and stars Jairo Camargo, Alina Lozano, Patricia Maldonado, Gilberto Ramirez, Paola Rey and Manuel Jose Chavez. The fifth annual Altazor Awards took place on April 5, 2004, at the Centro Cultural Matucana 100. The nominees were announced on January 22. Carla Evelyn Giraldo Quintero is a Colombian actress, model and singer. Escobar: El Patrón del Mal is a 2012 Colombian telenovela produced and broadcast on Caracol TV, based on a true story about the life of Pablo Escobar – the notorious druglord. It is available only in Spanish. There is a version available with English subtitles, as well as a version dubbed in Hindi on the ZEE5 app. Abraham Ramos is an actor who has appeared in many telenovelas and television series. He was born in Mexico City, Mexico. Drug barons of Colombia refer to some of the most notable drug lords which operate in illegal drug trafficking in Colombia. 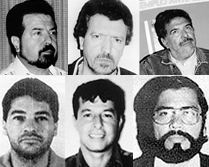 Several of them, notably Pablo Escobar, were long considered among the world's most dangerous and most wanted men by U.S. intelligence. "Ruthless and immensely powerful", several political leaders, such as President Virgilio Barco Vargas, became convinced that the drug lords were becoming so powerful that they could oust the formal government and run the country. Andrés Parra Medina is a Colombian film and television actor. He is best known for portraying the drug lord Pablo Escobar in the Canal Caracol TV series Pablo Escobar, el patrón del mal. Patricia Teherán Romero was a Colombian singer and composer, considered the most important female vocalist in the history of vallenato. Salvador Alejandro Jorge del Solar Labarthe is a Peruvian politician, lawyer, and an actor of television, theater and cinema. He is the current Prime Minister of Peru appointed by President Martín Vizcarra on 11 March 2019. He was Minister of Culture of Peru from 5 December 2016 to 27 December 2017 under President Pedro Pablo Kuczynski and resigned in protest of Kuczynski's pardon of former President Alberto Fujimori. ↑ O'Hara, Lilia, "When one makes art, one can't please everyone", San Diego Union-Tribune (June 10, 2004)p Night D.
↑ Gates, Anita (September 9, 2004) "Hagiography of a Drug Lord. The New York Times .